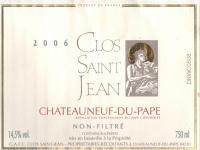 2009 Clos St Jean Chateauneuf du Pape - $49.99: Vins Rare, The finest selection of rare wines. If a prize were given to the Rhone Valley estate that had improved the most in the shortest period of time, it would undoubtedly go to that of Pascal and Vincent Maurel, who took over Clos Saint-Jean after their father passed away in 2002. Since then, they have made a succession of world-class wines that are out of this world. One of the largest estates in Chateauneuf du Pape, Clos Saint-Jean has an amazing number of old vine parcels in its 112+ acres (significant holdings in La Crau, in the eastern part of the appellation). No doubt the hiring of renowned oenologist Philippe Cambie has also increased the quality of these offerings. The 2010 Clos Saint-Jean Chateauneuf du Papes are phenomenal wines. The Maurel brothers believe they are as profound as the 2007s, and it is hard to disagree. Production is down considerably because of the loss of 25-30% of the Grenache crop due to poor flowering, but the levels of concentration, freshness and focus of these wines are remarkable. Moreover, the 2009s from bottle performed at the upper end of the ranges I had given them last year â€“ always a sign of a terrific winery dedicated to high quality.